Oxidizer Rich Staged Combustion means passing through the preburner all the oxidizer mass and just enough fuel to convert it to hot gas of the maximum temperature that your turbine will support. Fuel Rich would the the opposite. Full flow means having two preburners, one oxidizer rich and one fuel rich. With Kerosene you can't do fuel rich because RP-1 would polymerize at SC temperatures. But you can do FFSC with methalox, hydrolox and UDMH/N2H2. In fact, the only three FFSC powerpacks that reached a test stand that I know, each had a different propellant (RD-270->UDMH/N2H2, IPD->hydrolox , Raptor->methalox). So once they decided to use kerosene/LOX, they had to do ORSC. But you could want to do ORSC even with methalox, like the BE-4 does. The reason is that you go with staged combustion to have more power at your pumps. And the turbines are thermal machines with power proportional to delta-t * mass flow. Since your maximum temperature is always the same for Oxi rich and Fuel rich, your power could be very well approximated by specific heat * mass flow. Methane has better specific heat than oxygen, but you use 3.5 more mass of O2. When you do your numbers going ORSC gives you something like 20%~30% more power than Fuel rich for the methalox case. Hydrogen has such a ridiculous high specific heat that you always want to go fuel rich. Let me add that staged combustion is a gas-liquid the injector (one element of the propellant is liquid and the other in gaseous state when injected into the main combustion chamber). Full flow is gas-gas. Closed expander can be gas-gas or gas-liquid, and bleed expander is liquid-liquid. Tap-off is liquid-liquid. So is electrically pumped (i.e. Rutherford). Then you have the strange ones, like the RD-0162, that uses ORSC and fuel expander to be gas-gas. So trying to be too strict is quite difficult given the engineers creativity. Pre-project work on what is called the SCE-200 began about four years back. "We plan to have an [semi-cryogenic] engine and stage capable of flight by the end of 2018 and try it on the GSLV-MkIII. “The semi-cryogenic engine is getting fabricated. Testing of its pump and components has been going on. An engine testing facility is also getting set up at Mahendragiri,” Dr. Sivan said. Subsequently the plan is to have a modular vehicle (earlier called the unified launch vehicle) which allows variations suited to different payloads. I had a brief word with Mr Somnath (director LPSC) recently, asking him about the potential benefits of propellant densification (isrosene/LOX, hydrolox, methalox) for ISRO - he said the technology was certainly of interest to them. Is the SCE-200 essentially a derivative of RD-810 from Yuzhnoye? The specifications are rather identical. From what I have been able to research, the SCE-200 is developed from blueprints sold by Yuzhnoye. That same blueprint could be sold by the Ukrainian as the RD-810, if they had the money to actually build and test the prototypes. The YF-100 appears to have the same relationship with the RD-801. The semi cryogenic engine, which would help the space vehicles to carry more payload is under development with the support of an international agency and would be ready in two years. There is a roadmap enhancing the capabilities of the Isro to carry upto 10 tonnes of payload in future, he said. This apart, research and development activities in semi-cryogenic propulsion engine, air breathing propulsion and re-usable launch vehicle technology are also being pursued in earnest in an effort towards reducing the cost of access to space. Development of critical technologies for undertaking human spaceflight has also made additional progress. The activities carried out at IPRC, Mahendragiri are: assembly, integration and testing of earth storable propellant engines, cryogenic engines and stages for launch vehicles; high altitude testing of upper stage engines and spacecraft thrusters as well as testing of its sub systems; production and supply of cryogenic propellants for Indian cryogenic rocket programme, etc. A Semi-cryogenic Cold Flow Test facility (SCFT) has been established at IPRC, Mahendragiri for the development, qualification and acceptance testing of semi-cryogenic engine subsystems. The Indian Space Programme has made successful transition in terms of technology acquisition and launch vehicle development in the last year. PSLV went on to become a favoured carrier for satellites of various countries due to its reliability and cost efficiency, promoting unprecedented international collaboration. The Geosynchronous Satellite Launch Vehicle (GSLV) with indigenous Cryogenic stage, graduated to become an operational vehicle for communication satellites. Future readiness is the key to maintaining an edge in technology and ISRO endeavours to optimise, accelerate and enhance its technologies through establishment of facilities and forging partnership with industries. ISRO is moving forward with the development of heavy lift launchers, human spaceflight, reusable launch vehicles, semi-cryogenic engines, etc., to cater to different payloads and an array of missions. 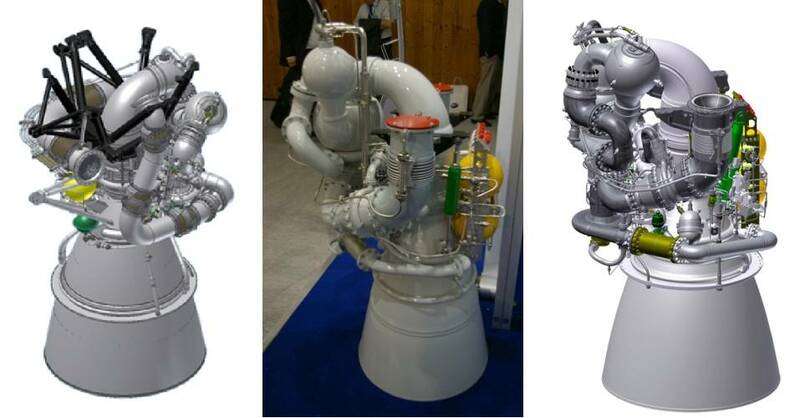 The semi-cryogenic Project envisages the design and development of a 2000 kN semi-cryogenic engine for a future heavy-lift Unified Launch Vehicle (ULV). The semi-cryogenic engine uses a combination of Liquid Oxygen (LOX) and ISROSENE (propellant-grade kerosene), which are eco-friendly and cost-effective propellants. at very high mixture ratios. Design of subscale Pre-Burner and Thrust Chamber is completed and realisation is in progress. Out of 21 types of engine control components, assembly and testing of 16 types have been completed. Assembly and testing of two types and fabrication of three types are in progress. Also, realisation of four types of control components for Hydraulic Actuation System (HAS) is in progress. Preliminary details of overall Stage configuration and stage engineering of Semi-cryo stage with 200 T propellant loading (SC 200) has been worked out. From a november publication of a meeting held on 27–28 February 2016 at VSSC ! V. Narayanan (Liquid Propulsion System Centre, Thiruvananthapuram) described the issues and problems in the development of liquid rocket engines and the role played by P. J. Paul at several stages. Amongst others, he spoke of issues with ignition in the gas generator section at low mixture ratio, and combustion instability problems of the new design of semi-cryo engine under development now. He emphasized that more theoretical studies were needed in respect of vacuum ignition of steering engine, ignition of gas generator at low mixture ratio, saw tooth pattern observed in the main thrust chamber after hot test and combustion instability modelling of semi-cryogenic engines for providing strength in making critical decisions in short duration high risk development of these engines. Not so surprising, the development of the ox-rich preburner (refered as "gas generator at low mixture ratio" ?) seems to be a difficult way to go. ANY NEWS REGARDING TESTING STATUS. As things stand now, the Indian semi-cryogenic engine stage is expected to be ready before the end of this decade. It was originally planned to be ready by the middle of this decade. Currently, the project for the development of Semicryogenic engine has been approved and the Semicryogenic engine is under development. The various activities carried out towards the development of the Semicryogenic engine include- (i) Indigenous realisation of 35 materials and 22 coating processes (ii) Qualification of indigenous bearings for turbo pumps (iii) Fabrication of the first hardware for three engine subsystems including low pressure turbo pumps and one high pressure turbo pump through industry (iv) Design validation of the low pressure turbo pumps through cold flow trials. An advanced space launcher that can deliver ten-tonne and heavier communication satellites to space requires a booster stage with clustered Semicryogenic engines. After the successful qualification of the Semicryogenic engine, the development of the Semicryogenic booster stage with clustered engines is expected to be initiated. Hopefully we have a test fire in russia before year end. SCE-200 is vital to ISRO from 2019 onwards. If the history in below link is true , then India is at loss as "it could not be copied, modified, upgraded, re-exporter nor transferred to a third party without the permission of Yuzhnoye "
For any higher thrust engine, India again needs to start from scratch. The information is that wikipedia article is outdated and misleading. As far as i am aware Ukraine supplied blueprints for certain components of the engine and provided input into the development of a certain alloy but ISRO still has the ability to upgrade and use the engine however they want. In fact there was some speculation sometime ago about the thurst being increased by 25% for application in a super HLV rocket however there are no official sources to back this up. The bottom line here is that it seems that the Ukrainian licensed production of the Energomash RD-120 engine has resulted in the design of that engine spreading by osmosis to India and China and use in their programs. Funny how that happened. Still not funny as the wholescale import of German scientists by USA and UK after WW2 to form the foundation of NASA.